Posted: Mon 27 Aug, 2012 12:11 am Post subject: Contest: Win More Windlass! Every year, August 25th celebrates the anniversary of the myArmoury.com forums and with this time a year one of the members of this site initiates a call to action. That call comes in the form of a donation drive to help me pay for the annual server hosting bill. For the last several years, the generosity of the membership here has offset this cost for me and kept me from having to pay for this whole thing out of pocket. As a means of appreciation, I usually put forth a contest to keep things interesting. We've given away a ton of prizes over the years. There have been several prizes made by Windlass Steelcrafts because these represent affordable items often worth well more than their price tags. Today's contest is another opportunity to win more Windlass! 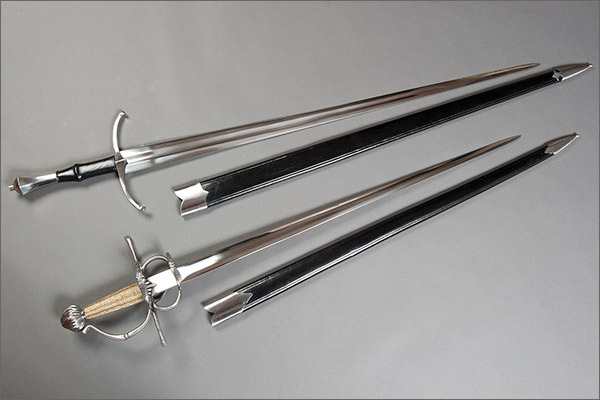 Both of these swords were donated by generous myArmoury.com member and previous contest winner, Michael Quinlan. Michael's idea was to use these prizes to benefit the site and so here we go! Both swords appear to be absolutely brand new! I had to remove the protective plastic coating off the scabbards just to photograph them. You must be a registered member of myArmoury.com and have donated $10 US or more within 90 days of the contest's start date or be a current member of the Benefactors, Upgraded Members, or Premier Members usergroups. Donations made after May 28, 2012 are considered. Please note that anonymous donations cannot be counted. Entrants must be made prior to contest close on Monday Oct 1, 2012 at Midnight PST. All participants will be entered into a drawing and the winning names will be randomly selected later that same day. I always liked the discontinued Towton, thought it was one of Windlass' better efforts. The other sword looks good too. Thanks to the people who contributed them to this contest..
Just entered the contest and those swords look really nice, and a bonus that at least one of them seems to be a discontinued one and hard to find in pristine as new condition. I will have to make an initial $10 contribution soon or I'll start feeling guilty entering the contest even if I'm fully eligible under other criteria. I think they're both discontinued. I looked around the internet for the Italian Renaissance Sword and couldn't find any mention of it. ohpleaseohpleaseohplease...either one! thanks for another great contest, Nathan! Thanks for such a fine contest! myArmoury is totally worth a small donation once or even twice a year! Good luck to all donators and eligible members! Thanks for the reminder for my yearly donation (which is nowhere near the value I get from this site each year). The competition is simply a bonus! And thanks again to Nathan for all he does for us. I've told him this before, but I'm amazed at how I can often find something with a quick search on myA that I don't turn up after hours of scouring my (modest, but not insignificant) library. Further, my arms and armour collection would not be what it is without exposure to the offerings from others here. Finally, I'm also always warmed by the level of knowledge, scholarship, humility, and friendliness in debate that infuses myA; this is real credit to Nathan's vision for the site, and skill and hard work in helping bring this community together. Just donated $25 to this great website to keep up it's excellent work!!! I've been meaning to make a donation and this contest was a good reminder! Beautiful weapons!! Thanks to the person that donated them! May the best swordsman win!!! 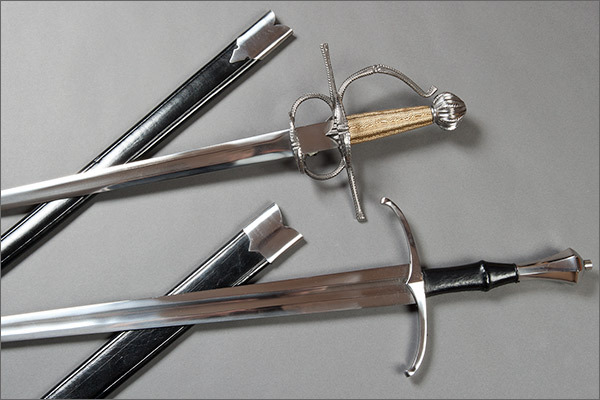 The Towton, my very first sword, long sold but it will always hold a special place for me. Would contribute anyway, but this certainly is extra incentive! FWIW, here's what I wrote about that Italian Windlass and the Wallace Collection original that inspired it. 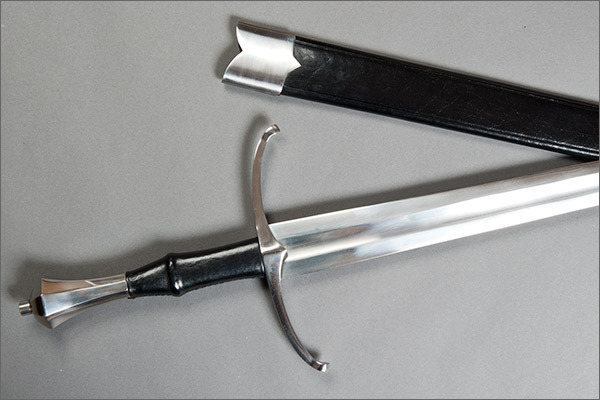 When MRL first introduced its "Italian Cut and Thrust Sword" I thought the hilt looked great but I didn't care for the blade. I was surprised to see just how faithful the repro is to the original. 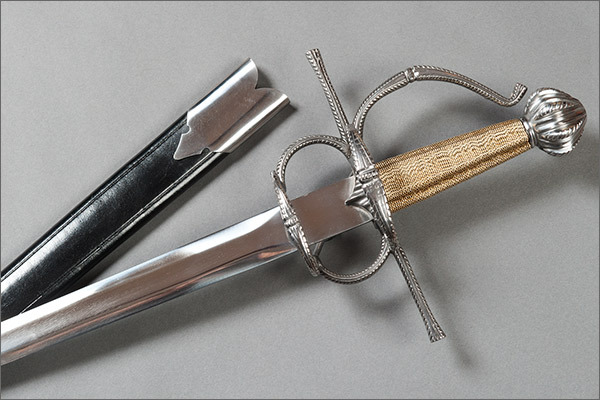 The Wallace Collection's weapon (A550, shown below) is 1540-1550, with a chiseled hilt, reeded grip with wire overwrap and unusual blade. Like that of the repro, the blade of the original has a ricasso of approx. 2" and a tapering blade of hexagonal section, with the flat rib in the center of the blade decreasing in width with the taper. The sloping flats of the blade are hollow ground. It isn't clear if the repro's blade includes this important detail, but it might. I'm much more inclined to buy the repro after seeing the original. That was 2007 and I STILL want that. If you think you don't want it or the Towton, donate anyway and drop me a line if you win! Holy cow. I've been looking for the Italian Cut & Thrust for a while! Thanks to all (some in advance) for their generosity in keeping this site alive and well. The contests are really a great idea and really enhance the contribution drives, something tangible to rally around. Often wondered why Windlass has not resurrected some of the more popular items; in particular the Towton. 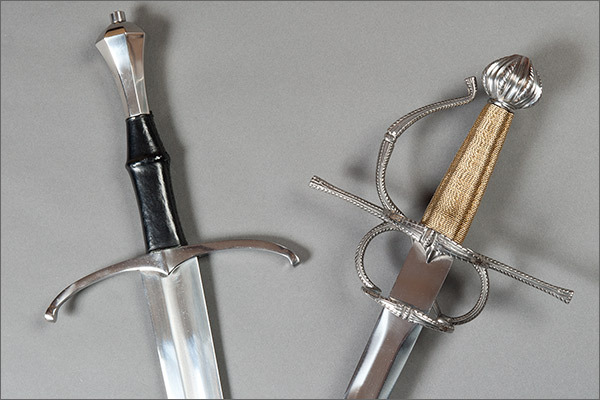 Certainly an interesting idea/bonus that these two swords would be easy to find a buyer should it not be within one's main collection focus or one already has a sword that fills the same niche in a collection. Nice prizes no matter if one keeps them or trade or sells them to someone who wants them more. At the time of writing this post, only one-third of those members eligible for this contest have actually entered. The chances of winning are very high! Damn, I kinda thought that I would automatically enter by purchasing a membership upgrade. I'm in now. Quick question, and not of the utmost importance but are membership upgrades purchases accounted as donations in the "donation drive" context? Good question, I wondered about that myself. Even if you're eligible, you have to click the button in Nathan's OP to enter the contest. Nathan can further comment, but I believe only PayPal donations (not membership upgrades) count in the total at the bottom of the forum home page. We can't force a person into a contest. We have to allow each person to opt-in themselves. Some members may have no interest in the contest, the prizes, or the terms surrounding it. Membership purchases aren't donations. They're membership purchases. It doesn't show up in the " Donation Total " but it's still very much supporting the site's ongoing expenses. With a fund drive it's a psychological " reward " seeing the total increase that one is missing here, but I don't think that this should dissuade people from upgrading their memberships as this is very useful and, I assume, a very appreciated and predictable annual influx of funds.